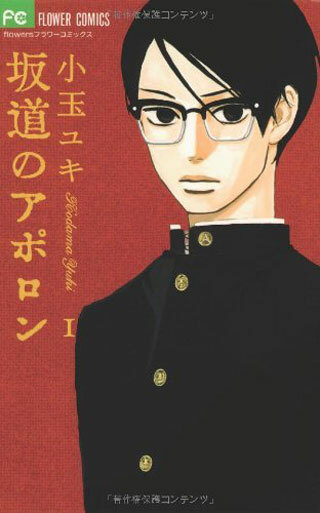 Kaoru Nishimi is the average "new kid" in school. He's the unsure transfer student we see so often in anime, but how quickly he makes friends is where he differs. 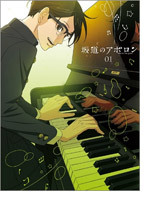 Sentaro Kawabuchi and Ritsuko Mukae, two childhood friends, welcome Kaoru into their group and discover their shared interest in jazz. 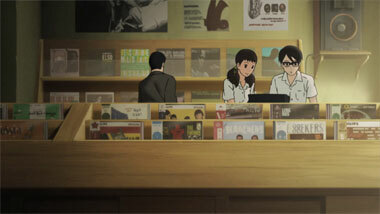 Soon Ritsuko's family record-shop is turned into a regular location of impromptu jam sessions and fills the building with colorful music. 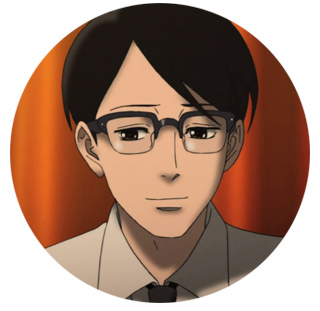 There was a lot of hype surrounding the announcement of Kids on the Slope, and with high levels of hype we must often prepare for disappointment. 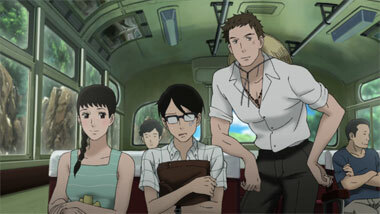 Instead, Watanabe crafts a fast-paced story in which jazz encompasses young love, broken hearts, and the emotion of youth. The story is so brisk it's sometimes a detriment to the show, rushing the viewer through important events - but thankfully this happens little. It's honestly Watanabe's skill as a director that holds the show together; the magnetic characters and speed of the story would decimate a lesser director. Not to say that Watanabe is perfect - even he still uses the same predictable emotional strings, tugging them exactly when the time is right. Two characters reminisce over playing the organ together, musing, "we're like kids!" And right on cue, you see them as children, fooling around and making music on the organ. Is it cheap? Perhaps, yes. Does it work? Very much so. The art is worth a mention due to its slight deviation from the norm. 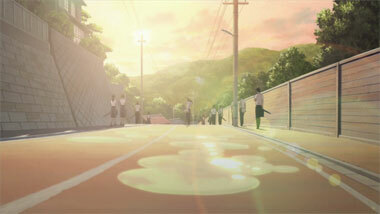 Rather than the hard edges and solid colors typically seen in TV animation, MAPPA and Tezuka Productions have used soft, blurred shading coupled with light gradients, giving the entire show a comfy, warm feeling. 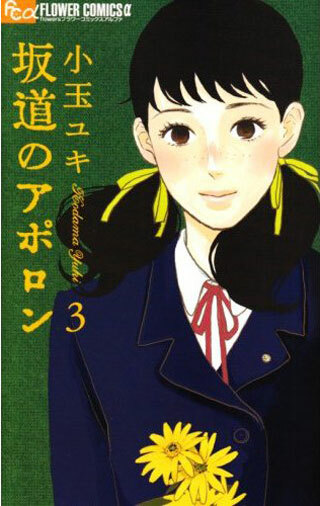 This works well with the golden color palette, evoking the 1960's seaside Japan setting perfectly. 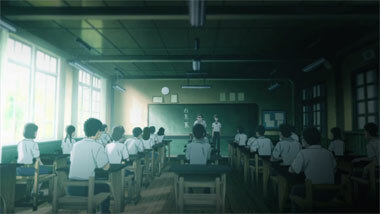 The animation is fairly standard for a TV production, with one notable and important exception: the musical performances. 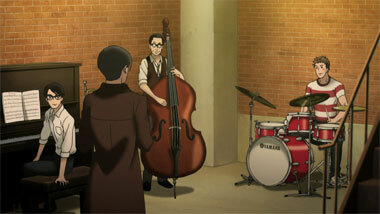 Using videos recorded of Yoko Kanno and other performers playing music for the show, the animators created smooth, amazingly accurate art of the characters and their instruments. It adds an extra layer of accuracy which gives the musical numbers a feeling of energy and authenticity that's above and beyond most other anime. 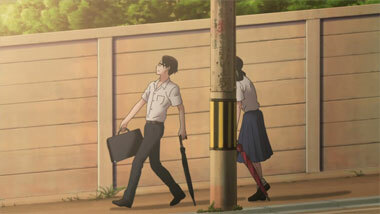 Above all, that's probably the best way to describe Kids on the Slope: authentic. Nothing feels extraneous or unneeded - everything adds to the story and pushes it forward. While the 'emotions of teenagers' is heavily traveled ground for anime, Watanabe manages to keep things active and interesting, despite pulling some well-worn tricks out of his hat every so often. 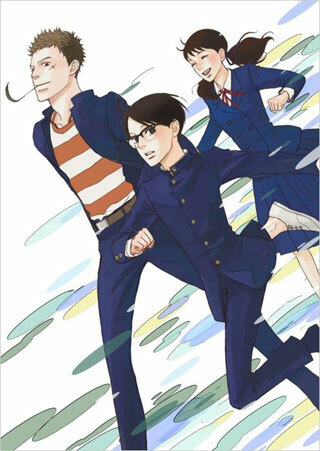 If the rest Kids on the Slope ends up terrible and plummets into inanity, it will still be worth a watch for this first half alone. 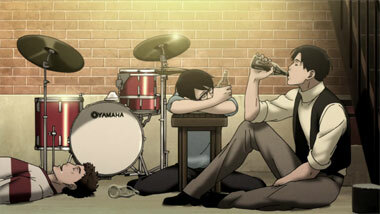 We think people will clamor for more from Watanabe and Kanno once again (as they did with Cowboy Bebop), since they've proven their combined efforts result in excellent television and music. 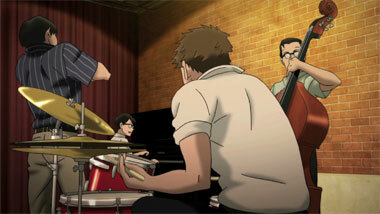 Kids on the Slope might not be the next million-selling hit, but its jazzy, energetic quality will ensure it is remembered for a very long time to come. 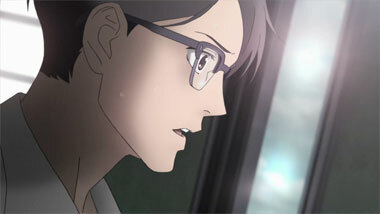 Below: Scenes from Kids on the Slope. 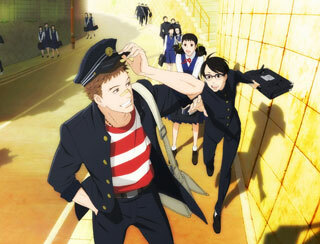 Below: Promotional illustrations for Kids on the Slope. 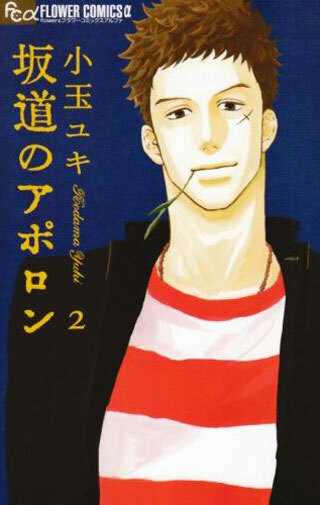 Below: Japanese manga covers from Kids on the Slope.